Model 990 Valves’ Super Seat© design is unique in nature and is copyrighted. The Flexible Super Seat© gives the ball a cushioning effect whenever it comes into contact with the body. The ball is always trying to reach the body while the valve is in operation due to intense pressure conditions inside the valve. However, the unique design of The Flexible Super Seat© gives the ball an added cushioning effect, thus extending the life of the valve. Model 990 Ball Valves’ Secondary Seal is made of PTFE (Poly Tetra Flouro Ethylene), which gives lasting life to the stem. The inherent properties of PTFE give the Ball a cushioning effect, thus keeping the ball intact. Model 990 Ball Valves’ design features the ball and stem as an integral piece, thus giving them longer life besides ensuring smooth and trouble-free operation. 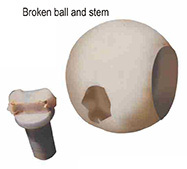 The two-piece ball and stem often tend to break down quickly. Model 990 Flexible Super Seat© shown (in the picture) along with other competitors’ Seat Design for comparative analysis. End-users looking for reliable, superior and longer lasting Ball Valves will naturally choose and specify Model 990 Fully Lined Valves. Model 990 Ball and Stem design being an integrated one-piece unit (as per the picture on right hand) offers longer life to our valves. In addition, the unique design of the Flexible Super Seat© gives our valves added life. 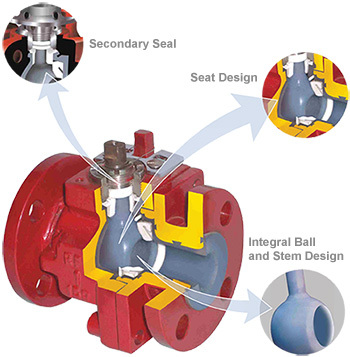 Use of a two-piece ball and stem design often results in breakdown (as shown in the picture on left), shortening the life of the valves. Model 990 integral ball and stem design assures longer life and trouble-free operation, compared to other lined ball valve manufacturers’ two-piece design.